Next month Transport for London (TfL) will start to replace the older, higher polluting diesel buses which run via Putney with cleaner models in a bid to reduce Nitrogen Dioxide (NO2) emissions. A Wandsworth Council air quality investigation has revealed that London buses are directly responsible for more than two thirds of the high street’s NO2 pollution which frequently exceeds EU limits. In response TfL has accelerated upgrades to Putney’s fleet. 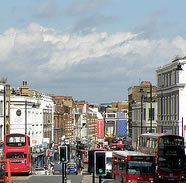 Currently, there are 177 diesel buses using the high street which fall below the ‘Euro 4’ emissions standard. From October TfL will begin to replace 46 of these with new, cleaner models including ten low emission hybrids. A further 85 of the older diesel buses will be retrofitted with advanced catalytic converters which significantly reduce pollution outputs. The upgrade programme begins in November this year and will be completed by March 2013. The remaining buses with sub Euro 4 emission standards will be upgraded by the end of March 2014, meaning every old diesel bus using the high street will have been replaced or its emissions reduced. The council’s air quality study has confirmed that the high street suffers from high levels of NO2 but fine particles (PM10) levels are within acceptable EU limits. NO2 readings elsewhere in Putney are significantly lower. By far the greatest source of NO2 is vehicle exhaust emissions. As the main road leading to one of London’s busiest river crossing, high volumes of traffic pass through the high street throughout the day. “Buses are by far the greatest source of pollution on Putney High Street and these upgrades can’t come soon enough. The council’s air quality investigation is the only one of its kind in London and has pushed Putney right to the front of the queue for green bus funding. We built our case on solid scientific evidence and the result has been TfL prioritising investment in the local fleet. “But we won’t stop here. Improving the buses will not solve the problem alone and we are working across several fronts. These include a new engagement programme with businesses based on the high street to help them reduce the emissions and traffic congestion caused by their deliveries.